For a project, I am currently working on, I have been trying to find out the size of Ankh-Morpork. How many houses/dwellings are there, what's the population and the physical size of the city? There is some information on Discworld & Terry Pratchett Wiki but I am not sure how accurate that is, due to it mentioning a population of about 1 million and the city being a mile across. The population would make sense, but surely the city is larger than a mile across? This information may be in the The Compleat Ankh-Morpork but I don't own this currently. Approx. 100,000 souls and ten times more inhabitants. What's so important about the last one? It's 100 years earlier, meaning that either Ankh-Morpork has no population growth or that all such values must be taken with a significant pinch of salt. Size from Wikipedia 5 miles across (8km) : I disagree with this too. 'Er...bingle bingle bingle...?' said a small and very nervous voice. 'It's twenty-nine minutes past five, Insert Name Here,' said the imp nervously. Now in the above quote, before getting home just in time for 6pm, Vimes is at 3 Tenth Egg Street and needs to get to 1 Scoone Avenue. From the map, that's just over half way across the city, but there's no direct route. I'm estimating that a brisk walk from the Commander of the Watch is 4mph, 30mins would be 2 miles. Tracing the route on the ground against the direct route as the crow flies I estimate the size of the city to be approximately 3miles diameter within the walls. In historical terms this is very large for a walled city. 1 mile would be far more reasonable. This leads to population density. In Thud we're introduced to Grag Bashfull Bashfullsson who lives in a corner of a room sublet from an entire family living in the same room. There are other examples of characters living in cramped lodgings consisting of a single room in a boarding house (Carrot, Angua, John Keel, Glod, etc). It should be considered relatively normal for people to be living entire families in single rooms to make up that population in such limited space. ‘’s woman?’ said Colon. He screwed up his sweating face with the effort of thought. ‘’s eight miles wide, sir. ‘’s gotta river in it. Lots of, of houses and stuff, sir,’ he reasoned. 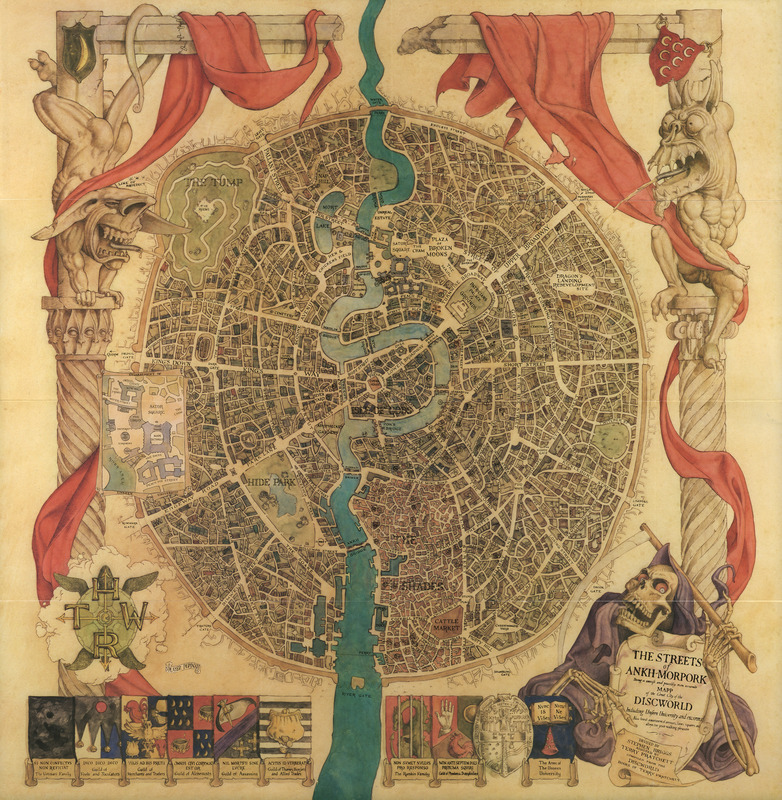 According to the map from "The Compleat Ankh-Morpork" that has a scale, the size of the city horizontally is about 2 km (5900 ft). But the size of a foot is not known to us, nor is the size of their mile.